MMR insert | Lawrence Broxmeyer M.D. Vaccines as an Autism Trigger: A TB Link? While it can’t be said categorically that vaccines trigger autism, it can’t be denied that many vaccines still contain toxic mercury compounds as well as animal and human components which may be contaminated with tuberculosis mycobacteria, with deleterious effects. At present, the cause of autism and its related spectrum disorders is unknown. Many hypotheses regarding what causes autism have been and will continue to be put forth, but only one will prevail: its true cause. A conversation as to whether vaccines trigger autism cannot be made in a vacuum but, rather, must be weighed against certain epidemiologic, scientific and historic considerations because its complexity is too great. California, in 1999, had been on high alert for some time. Level-one autism, without any of its “spectrum”, went from almost 5,000 cases in late summer 1993 to an estimated 20,377 cases by December 2002. As California’s Department of Developmental Services stood by incredulously, it witnessed a tripling of California’s autism rate and all but 15 per cent of cases were in children. California wasn’t alone, but its autism rates had become the fastest-growing group in that state’s developmental disability system and a number of Bay Area school districts were forced to fill entire classes with youths with different forms of autism. But even in the midst of California’s mini-epidemic, its Santa Clara County seemed particularly singled out. The California Department of Social Services’ aid, brokered by the San Andreas Regional Center, staggered to its breaking point, and its forecast for autism in Santa Clara wasn’t good. What was behind this epidemic? A major clue, overlooked from a critical standpoint, was contained in the timeline of the department’s own 1999 autism report1 which concluded that the disease had increased dramatically between 1987 and 1998. What had happened in California in and around 1987 that could have sown the surplus of autism that California now reaped? While autism exploded in California, there was also, beginning in 1987, a major spike in the number of tuberculosis cases reported by the Tuberculosis Control Branch of California’s Division of Communicable Disease Control. There, division head Dr Sarah Royce proclaimed a tuberculosis (TB) epidemic in California. The epidemic peaked in 1992, had the same male preponderance as autism, and took off at precisely the same moment in time. It had to be more than a coincidence, therefore, that since the 1980s California experienced a dramatic increase in the number of children diagnosed with autism as well. If California was experiencing autistic tremors, then surely its Santa Clara County was at the epicentre. By 2006, Santa Clara had some of the highest rates for autism in the entire USA. Although this was for unknown reasons, again the question became: why Santa Clara? The answer pointed in a similar direction. Santa Clara’s Health Department sounded the alarm. Santa Clara now knew that it had two problems on its hands. Its medically trained psychiatrists, doctors, personnel and statisticians just never stopped to think that the two problems might be related. In most of the 20 cases, the California Encephalitis Project cultured out tuberculous encephalitis, the same tuberculosis considered the least likely cause for encephalitis. Yet there it was. But, as Christie pointed out, as little as 25 per cent of patients with a diagnosis of CNS TB actually cultured out TB, which was a criterion for this particular study. That means that only a quarter of possible cases were confirmed. Mr Burton: Thank you for your testimony. Everybody knows the value of vaccinations. And every time you testify, you tell us how valuable they’ve been. And we already know that. We’re not here to say that vaccinations aren’t important. They’re very important. They’ve given us the highest quality of life of any civilization in the history of mankind. That isn’t what we’re talking about. We’re talking about why they’re putting mercury in vaccinations and why it’s never been tested since 1929 when Lilly developed it. Mr Burton: Has thimerosal ever really been tested? Has thimerosal ever been tested by our health agencies? Mr Egan: Only in those early tests that you know of that were done by Lilly. Mr Burton: When was that? That was done in 1929. Let’s follow-up on that. In 1929, they tested this on 27 people that were dying of meningitis. All of those people died of meningitis, so they said there was no correlation between their death and the mercury in the vaccines. That is the only test that’s ever been done on thimerosal that I know of. Can you think of any other? Mr Egan: No, in people, no. Except for accidental exposures over time. Mr Burton: OK. Now, my grandson got nine shots in one day, seven of which contained mercury. So if he got the very small amount, he’d be getting maybe nine micrograms, right? Mr Egan: No, much less than that. Because the maximum that we calculate that a child could receive now during the first six months of life is somewhat less than three. A number of these vaccines [have] defined trace as less than one, some of them have considerably less than one. Mr Burton: But that amount of mercury would not do any neurological damage to anybody? Mr Egan: Not according to any guideline. Mr Burton: No, no, no, no. I want you to say yes or no. Mr Egan: I do not believe so. Mr Burton: You do not believe so. I didn’t say believe. Can you say to me right now that amount of mercury being injected into a baby will not hurt it? Mr Burton: That’s right. So it is possible that the amount of mercury that’s being injected, even in trace amounts, could damage a child neurologically, right? Mr Egan: I don’t think it has that capacity, no. We can argue. Mr Burton: I know, but you don’t think it is, but you can’t say categorically, can you? Congressman Burton had established, as of 2004, that the only study ever done to conclude that thimerosal was not neurotoxic or could not precipitate the first signs and symptoms of autism was done by its manufacturer, Ely Lilly, in 1929—a study in which 22 meningitis patients (not 27, as Congressman Burton mentioned) in an Indianapolis epidemic were treated with thimerosal, all of whom died. Lilly showcased and funded the study for one reason and one reason only: its scientist Smithburn, the study’s lead author, out of the sheer desperation of having nothing with which to cure his patients, had injected 22 of those patients dying of meningitis with large doses of thimerosal (up to 10 milligrams per kilogram intravenously) with supposedly no significantly grave consequences.12 That is, no grave consequences other than the fact that seven out of 22 of Smithburn’s patients died within one day after receiving the thimerosal. Only one patient made it to day 62 before succumbing—hardly enough of a window to investigate for chronic mercury damage from the thimerosal. Nevertheless, Lilly would next try to turn a lemon into an orange, sponsoring other scientists13 to say that the thimerosal had nothing to do with the deaths of Smithburn’s meningitis patients. 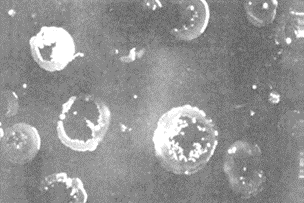 In back-to-back studies of the Indianapolis outbreak of 1929, Smithburn, present in the initial investigation, left the second-phase probe to Kempf, Gilman and Zerfas.18 Both publications showed how anti-meningococcal serums were of little or no use for the Indianapolis outbreak—an unexpected finding for a meningococcal meningitis epidemic. 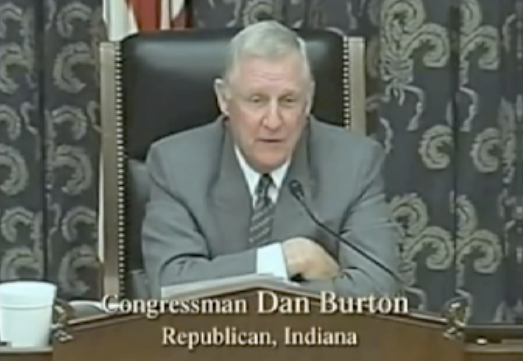 As he left the congressional hearing, very much on Congressman Dan Burton’s mind, after having grilled the FDA’s Dr William Egan, was that despite promises time and again to remove mercury from vaccines it never seemed to happen. Figure 1: One of the stealth, viral-like forms of “cell-wall-deficient” atypical tuberculosis colonies that grew from the brain of a child who expired from the disease. Such forms of tuberculosis are extremely difficult to detect and require special stains and culture media not used routinely in today’s laboratories. (Source: Korsak, T., Acta Tuberc. Pneumol. Belg. 1975; 66:445-469). 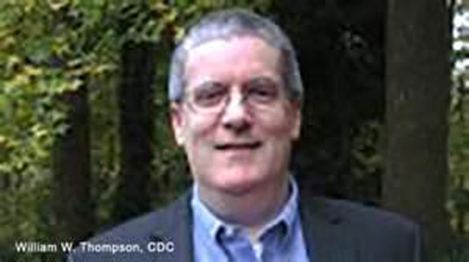 On 27 August 2014, CDC scientist Dr William Thompson spoke out, admitting that he had co-authored a study23 which purposely cooked the data to avoid showing that African-American infants and toddlers given the MMR (measles, mumps, rubella) vaccine before 36 months of age were at a 340 per cent increased risk for coming down with autism. At the time of the study, and for a decade after, Thompson was silenced—but troubled. This was no average witness; this was a man who knew the intricacies of the study and the original data obtained like the back of his hand. Obviously, the CDC’s doctored 2004 study was an attempt to clear the MMR vaccine of troublesome implications—an attempt to give the vaccine a clean bill of health. But if the study’s purpose was to examine honestly the possibility of a causal relationship between the MMR vaccine and autism, it failed miserably. Attkisson: Were you aware of any of his [whistleblower William Thompson’s] concerns of, you know, have you been aware before today of any of his concerns about this? DeStefano: Uh, uh, yeah, I mean I’ve continued to see, uh, uh, see him for over the past ten years and we’ve interacted fairly frequently, and, uh, uh, no I wasn’t aware of this. Attkisson: So whoever he raised his concerns to, he didn’t, he didn’t raise it to you or anybody you knew of? Attkisson: Is there any possibility that it is biologically plausible and you just haven’t, you know, that that’s, the consensus is that it’s not, among you guys, but that it is and you’re overlooking that? DeStefano: I’m, I’m not aware of any data that would say, you know, that would s-, you know, that would say that, uh, you would have, um, onset of autism after 36 months. The MMR, then, could very well be acting adversely in the fashion described by Osler through statistical evidence alone—but there was much, much more. Of all the issues of concern regarding a vaccination–autism link, one of the most prominent is, according to Sugarman28, the continued use of thimerosal in certain influenza shots, especially the widely used and economical multidose influenza vials through which many patients can be vaccinated using the same vial of influenza vaccine. Most of the legal battles over vaccines and autism, Sugarman mentions, have alleged that the first signs and symptoms of autism were precipitated by this mercury-containing preservative, which used to be an ingredient in many childhood vaccines and still is found in some of the multidose flu shots used by paediatricians. Others have argued that the culprit is the measles, mumps and rubella vaccine (MMR) or perhaps MMR in combination with thimerosal. Yet in many other autistic cases, a direct causal link is not there for either. Nevertheless, the thought lingers that these agents as well as other vaccines could, in certain cases, still trigger the first signs and symptoms of autism. In the meantime, the lay term pointing to “toxins” in the vaccines is inadequate. Whenever one deals with biologicals originating from the cow, the calf, the chicken, the chicken embryo, the swine or from another human in the form of albumen or a foetal cell line—all found in the MMR—one hits upon the potential of such biologicals used in the vaccine bearing or being contaminated by mycobacterial infection. This holds particularly true of a vaccine like MMR, whose components can potentially carry Mycobacterium tuberculosis from human fluids or tissue, Mycobacterium avium from poultry (a subspecies of which is Mycobacterium paratuberculosis) or Mycobacterium bovis from cows or the foetal tissue of cows. And in this case, we are not talking about mere environmental exposure: we are talking about direct injection through vaccination. To say that the US Department of Health and Human Services’ Food and Drug Administration is aware of this is a stark understatement. One just need download its “Guidance for Industry”29 for viral vaccines—a 50-page paper—each page carefully framed under the heading “Contains Nonbinding Recommendations”. In such a “Guidance for Industry”, the words and warnings for human Mycobacterium tuberculosis as well as mycobacteria from animal sources are scattered throughout. The MMR vaccine is generally administered to children around the age of one year (12 months), with a second dose before starting school (i.e., at age 4–5). Johne was the first to report a case of congenital TB in animals, his specimen consisting of the very same bovine foetus.31 Macroscopically though, he noted, the uterus and placenta of the pregnant cow were normal. Although it is claimed that in the United States TB “once was” a common disease of farm poultry flocks, cattle, swine and people, this author remains unimpressed with present governmental agency attempts to diagnose both the bacilli and, moreover, their predominant cell-wall-deficient forms. As another strategy to hide the true incidence of TB, our domestic animals and poultry are often killed young before the onset of tubercular disease becomes obvious.36 Furthermore, most inspection is done visually. In the meantime, the USDA continues to downplay and ignore the actual incidence of TB not only in cows and their milk (especially with regard to paratuberculosis) but in poultry and eggs. For example, when forced to address the issue of finding paratuberculosis in containers of milk, the USDA initiated a study in 1998, but first used methods like freezing and ultrasound to damage the very mycobacteria being tested for, and then ignored established techniques to isolate mycobacteria related to TB, growing samples on a culture medium which was considered inadequate—and for not nearly a long enough time.37,38 Not surprisingly, the USDA results in that study were all negative. Actually, WI-38 is a human cell culture line composed of fibroblasts which were derived from the lung tissue of a three-month-old white female foetus. It is commercially known as “WI-38 (ATCC® CCL-75™)”. First sequestered by Hayflick and Moorhead40 in the 1960s, WI-38 has been used ever since in the production of many of our vaccines. Finally, in the MMR we have the chick embryo cell culture used to propagate the mumps and rubella (German measles) viruses. Although authorities seem totally unconcerned today, Hull41, Trylich42 and Romanenko43 all certainly saw the danger of tuberculosis from tubercular hens getting into embryonated chicken eggs. Chick embryo cell cultures also consist of hydrolysed gelatin as well as human albumen. Hydrolysed gelatin is the hydrolysed connective tissue from an animal—usually from the skin and bones of an animal, generally a pig. The process involves adding enzymes which break down the proteins. It separates the proteins along hydrogen bonds. Then the foetal calf serum from the blood drawn from a bovine foetus through a closed system at a slaughterhouse is also added. Against all of this you have the antibiotic neomycin added to the MMR in an attempt to contend with any unknown mycobacterial content in the vaccine—which neomycin by itself is totally unequipped to do. Almost lost in the package insert of Merck’s popular MMR II vaccine is the admission that no studies have been reported to date of the effect of the measles virus vaccine in the MMR on untreated tuberculous children: “However, individuals with active untreated tuberculosis should not be vaccinated.”44 Although infants and children are “individuals”, so difficult is it to isolate TB in them that some paediatric experts recommend a spinal tap in all children under 12 months of age.45 Yet it is specifically at 12 months of age that mandatory MMR vaccination first cuts in. “They believe that TB is an extinct disease. I don’t know why.”46 So said Mario Raviglione, MD, infectious diseases specialist and Director of the World Health Organization’s Global Tuberculosis Programme about a disease which WHO admits infects a third of the world. While frontal assaults on thimerosal, the MMR vaccine and the overburdened vaccine schedule have justifiably sprung up, a satisfactory and comprehensive explanation as to why and how vaccines might trigger autism has not. In a 2013 interview, Mel Spigelman, MD, President and CEO of the TB Alliance, a nonprofit TB drug research group based in New York, said of tuberculosis: “It’s still in the US, we just don’t recognize it.”47 Perhaps this is because we just don’t want to recognise it—in ourselves, in our livestock, in the products from our livestock, and in the biologicals used in our vaccine manufacture. But it won’t let us not recognise it. While a blanket statement that vaccinations cause autism cannot be supported, the assertion that certain vaccines can aggravate and precipitate the first signs of an autism originating from chronic disease cannot be denied. A vaccine or group of vaccinations could trigger autism simply by inadvertently introducing, through their human, animal and poultry components, mycobacterial elements into the mother, foetus or young child. Mixed tubercular infection in man with human and fowl TB isn’t a new discovery: Tsukamura and Mizuno64 found it rather commonly in their 1981 study. Once introduced, one tubercular form can potentiate and make more virulent an existing tubercular infection. Another way in which vaccine components can trigger autism was laid out by Hartz in his JAMA probe regarding how mercury compounds like thimerosal activate and make much worse an existing tubercular infection. In comparative and simpler terms, one might look at an injection of certain vaccine oil or lipid adjuvants, squalene among them, whether inside or outside of a vaccination, as lighting up chronic foci of tuberculosis like a Christmas tree; or, in the words of Sir William Osler, chronic tuberculosis “may be lighted into activity by vaccination”—for a few reasons, key to why vaccines, in certain cases, can trigger what a child’s parents clearly see as the first signs of autism in their toddler. Pennsylvania internist and medical researcher Lawrence Broxmeyer, MD, was on the staff at NY affiliates of Downstate, Cornell and NYU for 14 years. He was the originator and lead author of a novel way to kill AIDS mycobacteria (J. Infectious Diseases 2002; 186:1155-60). His ideas on phagotherapy are still in use today. He contributed a chapter to the textbook Patho-Biotechnology (Landes Bioscience, 2008). His peer-reviewed articles are on PubMed. He is the author of several books including AIDS: What the Discoverers of HIV Have Never Admitted (new edition, July 2014; see review in 20/01) and Autism: An Ancient Foe Becomes a Modern Scourge (2012). 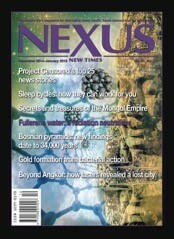 He has had several articles published in NEXUS: “Ebola…or African Strains of Tuberculosis” (22/01); “Influenza and the TB Connection” (19/01-02); and “The Untold Truth About Cancer” (17/01-02). Dr Broxmeyer can be contacted by email at nyinstituteofmedicalresearch@ yahoo.com. For more information, visit http://lawrencebroxmeyermd.com. 41. Hull, T.G. Diseases Transmitted from Animals to Man. Springfield, Illinois: Charles G. Thomas Publisher, 1947, 3rd ed.